Welcome to another installment of LiveAnalysis! Today we have the fifteenth meeting between World No. 1 Novak Djokovic and World No. 10 Stanislas Wawrinka. Click here to see how Novak Djokovic has arrived to this, his seventh straight US Open semifinal, and click here to see how Stan Wawrinka made it to his first ever Slam semi. Click here for the detailed H2H between these two (which Djokovic leads 12 to 2). The last time Stan beat Novak was way back in the fall of 2006 in Vienna. At that time, Djokovic had only won one title (Amersfoort), and Stan actually pulled ahead in the H2H 2-1. The Swiss has lost 11 straight matches since, winning only 5 sets in the process (and that’s including the 2 he took in their Australian Open epic earlier this year). 1. Can Stan Wawrinka summon the kind of form he showed against Djokovic in Australia this year? This is an extremely tough ask: Stan played (by his own admission) the best match of his life. Those of us who watched that particular match would agree: Stan red-lined for long stretches of that battle (indeed, he should’ve been up 2 sets to 0). But what does this actually mean in terms of shots? Simple: the ability to be ultra-aggressive all the time off both wings, along with an impeccable serving performance. That’s what Stan did in Australia, and it wasn’t enough to pull through. Though he came as close as you can possibly come. 2. Will Novak Djokovic be more proactive during rallies, and look to attack instead of simply trying to weather the storm? In Australia, Djokovic rarely went beyond damage control, mostly because he seemed to lack the necessary confidence to take control of rallies from the middle of the court and get Stan on the run. This was also due to the fact that Stan was coming up with ridiculous counterpunching shots whenever he was attacked. Still, the main reason Djokovic has beaten Stan 11 straight times is because the World No. 1 has found ways to consistently outmaneuver Stan along the baseline using his trademark down-the-line shots into the open court to push the Swiss back and get him to hit on the run, where he traditionally isn’t as dangerous as when he’s closer to the baseline. Of course, key to this scheme is Djokovic’s backhand down the line, which has been faltering throughout 2013, particularly during big matches. 3. Can Stan find ways to punish Djokovic’s second serve much in the same way he put pressure on Andy Murray’s second delivery? The difficulty here is that Djokovic has been using his very decent 2nd serve kicker more often than not, and Stan isn’t really able to take that serve on the rise, particularly on the backhand side (which is where Djokovic likes to aim that serve anyway). Also, it’ll be interesting to see if Stan can dominate with his serve like he did against Murray. Let’s remember that the defending US Open champ lost the match without creating a single break point on Stan’s serve. We should be starting very, very soon. 0-0: The first point of the match is a service winner up the T. 3 more unreturned serves follow. Djokovic went to the T on the Deuce court with great success. 1-0, Djokovic: Stan holds to 15 in a game that showed only 2 rallies, both of which were won by Stan via FH winners. Djokovic showed some willingness to go on the offensive with a FH DTL, but the effort was wasted when he misjudged a Stan lob and had to scramble just to get the ball back in play. 1-1: Stan starts to be aggressive off the ground, now that he actually got serves back in play. He’s trying to use big CC FHs, which is a great strategy against Djokovic. He gets a 15-30 lead that later becomes Deuce after a Djokovic BH UFE (2nd of the game). Another Djokovic BH UFE (DTL) gives Stan the first BP of the match. It should’ve been saved in a much straightforward way, since Djokovic got a good serve up the T to set up a short FH, but he sent the resulting smash straight at Stan. Thankfully for him, he got a look at some more short FHs. However, a Djokovic DF sets up BP #2 for Stan. And the break comes, after Djokovic’s regulation FH clips the net and lands out. Stan up an early break! Tactical Update: It’s fairly obvious Stan wants to play a lot of cross-court rallies, particularly with the FH. Djokovic has to get the better of the CC BH rallies, but so far he’s been leaking errors of his usually rock-solid two hander. 2-1, Wawrinka: Djokovic tries to use his FH to dominate rallies, but sends one long when he was fully in control of a point at 0-30. Stan avoids the BPs with a glorious baseline smash. Again, the rally started with a lot of big Djokovic FHs that couldn’t tip the balance. Then another Djokovic BH DTL UFE gives Stan a GP. Another Djokovic UFE gives Stan the consolidating hold. 3-1, Wawrinka: Djokovic now comically avoiding his backhand – he’s running around it as much as possible. He then DFs and it’s 15-30. Moments later, Stan has another BP at 30-40. Wawrinka gets yanked wide on the FH, but comes up with a blistering running FH winner. Djokovic was nowhere near it. Stan with a double break! Tactical Update: Djokovic has combined two of the worst things you can do on a tennis court: start slowly, and panic. He’s running around his backhand like he’s Feliciano López or something, which leaves him some awkward I-O FHs, and compromises his court positioning. Stat Update: Novak Djokovic has 10 UFEs in just 5 games of tennis. 4-1, Wawrinka: Djokovic finally gets the better of a FH exchange, by using a nice angle along with a good I-O FH. However, that came at 40-15. However, a Wawrinka BH UFE brings it to Deuce. A first BP for Djokovic comes after Novak correctly stops play after a Stan shot that landed out and was called in. However, the BP is wasted on a FH UFE that just misses. Another BP for Djokovic is triggered after a nifty cat-and-mouse game at net, which Stan botched. Djokovic gets the break via a Stan BH DTL UFE. Stan has 29% first serves in and is still well ahead against one of the best returners ever. Work that out. That stat was actually from midway through that last game. After the game ended, the number ended up being 35%. Still ridiculously low…and yet Stan is up a break. 4-2, Wawrinka: Djokovic tosses in a DF, then an ill-advised net approach, and he’s down 0-40. And a 4th DF for the match seals the break for Stan. 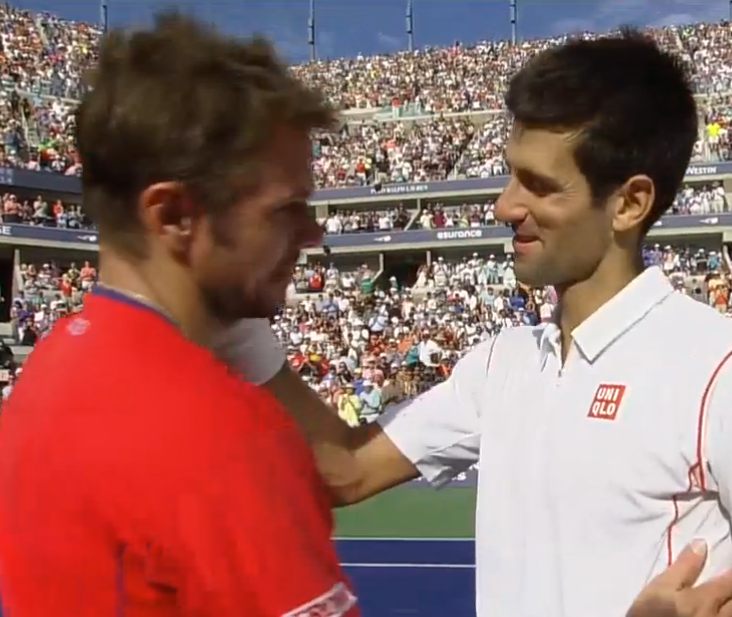 5-2, Wawrinka: Stan races to a 40-0 lead, and Novak Djokovic finally plays a good point with his BH. It’s all for naught, as Stan sends a nice SW out wide, and he’s taken the set. First Set to Stan Wawrinka, 6-2. 0-0: Once again, Djokovic plays an impeccable set-opening game. Things didn’t go all that well for him the last time that happened. 1-0, Djokovic: At 30-all, we get a signature point of this match: Djokovic tries to attack with his FH, can’t find an opening, Stan gets a look at a couple of FHs, and then pounces decidedly with a CC FH bomb. Smart, simple tennis. A service winner nets him the game. Earlier in the game, Stan also hit a glorious running FH DTL winner that made no sense whatsoever. 1-1: Djokovic races to a 40-0 lead, but Stan then pummels a 2nd serve, much in the same way he did against Murray. Then Djokovic tries to go for a silly BH DTL, and to the surprise of no one, misses. When you’re struggling with a shot, the worst thing you can do is try to go for it from awkward positions. However, Djokovic does end up holding to 30. Stats Update: Novak Djokovic has so far accumulated 7 BH UFEs off the ground. Just 4 FH UFEs off the ground. For a man who uses the backhand to anchor the rest of his game, this is wildly problematic. 2-1, Djokovic: Stan had a 40-15 lead, but it evaporates. Djokovic has a look at a BP, but wastes it when he can’t put a tame 2nd serve back in play. However, Stan gets a little sloppy, so there will be a new BP for Djokovic. The best point of the match ensues: a violent CC BH rally morphs into a FH CC rally, which turned the tide in favor of Stan. Djokovic actually got better CC FHs than CC BHs, but still couldn’t get a chance to truly go for it. However, Stan gets sloppy once again, and after getting a GP, donates 2 straight UFEs. BP again for Djokovic. Novak gets an incredible return back in play, goes on the offensive with the CC FH, then gets a look at a FH DTL….but misses by a few miles. Two unreturned serves give Stan the key, key hold. 2-2: Djokovic pays an incredible tribute to Andy Roddick’s net forays at 30-15. Naturally, he got summarily passed. Stan then hits a great winner, and he has BP. Then, Djokovic amps up the pace on his shots, and saves the BP decidedly. Great defense by Stan, though. Another BP for Stan, as he sends a BH DTL winner past Djokovic. It is saved by a great serve up the T + CC FH combo from Djokovic. Another BP for Stan via another great BH DTL. Stan survives a good wide serve, gets a look at a I-I FH, and forces the error. Stan goes up a break! 3-2, Wawrinka: Stan plays a confident game, and holds easily to 15. The only “notable” happening of that game was that Djokovic got called for a coaching violation. Sadly for the World No. 1, there’s no amount of coaching, no silver bullet, that could possibly snap him out of this mediocrity. 4-2, Wawrinka: Djokovic insists with ill-advised net forays, and falls behind 15-30. However, he finds some good serves and reels off 3 straight points. There’s an obvious parallel between this match and the 5-setter in Australia: Stan was up a set and a break there, but couldn’t hang on to get the 2-set lead. However, I think there’s a crucial difference: in Australia, Stan started to cool off from a blistering start, and Djokovic upped his game. Here, it’s more like the opposite: Stan has merely been solid so far, but slowly but surely he’s started to show flashes from the Australia form. 4-3, Wawrinka: 2 good returns by Djokovic give him a 0-30 lead. Soon it’s a 15-40 edge thanks to a Stan BH DTL UFE. However, the first BP is saved via some forceful I-O FHs by Stan into Djokovic’s BH. Read that again. However, just as the 2nd BP was settling into that same dynamic, Stan shanks a FH, and Djokovic gets the break! 4-4: The World No. 1 is showing some signs of life: an amazing running FH winner makes it 30-0. Soon it’s 40-0. The game is sealed with a thumping 2nd serve SW. The World No. 1 has finally arrived to Flushing Meadows. Better late than never, eh? 5-4, Djokovic: Stan correctly realizes that unless he takes the initiative in rallies, he’ll get in more trouble. He amps up the mph on some FHs, and is up 40-15. Djokovic then wins what might be his first BH exchange of the match, and it’s 40-30. Then…the point of the match ends with a simply horrific miss by Stan. It was a glorious rally that involved all areas of the court, but Stan ends up biffing the very easy putaway after a Djokovic shot clipped the net. However, Stan finds two very good serves and holds. That was so key for Stan: his miss at 40-30 was downright catastrophic. Plus, it came after a grueling, violent point. Many kudos to him for finding the strength to find 2 serve bombs to escape the game. 5-5: Stan gets a look at a simple volley…and nets it. In a worrying stat, Wawrinka has now hit 17 UFEs in the 2nd set. Moments later, Djokovic completes the simple hold. Also, Djokovic only has 5 UFEs in this set (compared to 10 in the 1st set), but Stan has gone from 6 in the opener to 18 (!!!) in this second set. 6-5, Djokovic: Stan fires an ace out wide to hold to 15, and we’re into a tiebreaker. Tiebreaker – Novak Djokovic will serve first. 0-0: Djokovic fires FH after FH (2 were shanks that somehow landed in), but finds enough space to fire an I-O winner. 1-0, Djokovic: Djokovic rushes Stan on his FH corner, and forces the error. Minibreak. 2-0, Djokovic: Stan gets a short return he can pummel, and does so. 2-1, Djokovic: Djokovic once again comes to net on a very mediocre I-O FH approach, and can’t handle the volley. Minibreak. 2-2: SW up the T.
3-2, Djokovic: Stan now DFs. Pretty sad. Minibreak. 4-2, Djokovic: 2nd serve again. A very tame rally ends with an exclamation point, as Stan Wawrinka blasts a CC FH winner when Djokovic essentially baited him into it. Novak might regret not doing more during that rally. 4-3, Djokovic: 2nd serve. All forehands from Djokovic, and his I-O cannon comes to the rescue. Again, he’s not trusting his BH at key moments of this match. 5-3, Djokovic: 2nd serve. Correct the above statement: it’s all BHs now from Djokovic, who survived an early angle by Stan, who ends up donating the BH UFE. 6-3, Djokovic: Novak returns the favor with a tame FH UFE into the net. 6-4, Djokovic: Stan tries to S&V, out of nowhere, and he gets passed. A puzzling decision by Stan. Minibreak, and the set. Second Set to Novak Djokovic, 7-6(4). Third Set – Stan Wawrinka will serve first. 0-0: Stan makes a couple of UFEs, and it’s 30-all. He then DFs, so it’s BP for Djokovic. It is saved via a SW up the T. Stan then clinches the game with a hard, deep approach up the middle. 1-0, Wawrinka: Djokovic replies with an easy, quick hold to 15. 1-1: Stan replies in kind. 2-1, Wawrinka: At 15-30, Djokovic finds the sideline with an I-I FH. Crucially. Moments later, Stan nets a BH DTL, and Novak has held. 2-2: Stan holds to 30 with a magnificent CC BH winner. That was the lone remarkable aspect of that game. 3-2, Wawrinka: Djokovic sends an ugly DF at 40-15, but then Stan sends a regulation shot long. We sleepwalk to crunch time in this set. 3-3: Stan misses a simple putaway by about 2 feet, and it’s 15-30. Then Djokovic sends a FH wide. 30-all. And then, we get the best point of the set by far – it’s a forceful rally that ends with Stan forcing Djokovic’s error off the BH. A wide SW seals the hold. 4-3, Wawrinka: Out of nowhere (and in what seems like 30 seconds), Djokovic is down 0-40 after a FH UFE. He then nets a regulation FH, and Stan gets the break and will serve for the set. 5-3, Wawrinka: Stan flies off to a 30-0 lead, but then contributes 2 FH UFEs for 30-all. Then, one of the best rallies of the match ensue, but it ends with a complete brainfart by Djokovic, who tried to go for a BH dropper while off balance. SW up the T by Stan, and he’s taken the set. Third Set to Stan Wawrinka, 6-3. Fourth Set – Novak Djokovic will serve first. 0-0: Djokovic starts off with a simple hold. Stats Update: One stat that might tell the story of the match is % of Receiving points won. In the 1st set, Stan got the +11% edge in that category. Set 2? Djokovic was +11%. Set 3? Stan was +11%. 1-0, Djokovic: Stan comes up with an atrocious dropper + lob combo, and is down 0-40. First BP is saved when Djokovic can’t get a passing shot by Stan, even though he had plenty of time and space to do so. Stan fires an ace to save the second, but then DFs away the break. Djokovic with the early break. 2-0, Djokovic: Stan is losing the grip on this match, as he destroys a racquet after a silly UFE, and receives a point penalty, since he had blasted a ball into orbit earlier in the match. Djokovic consolidates easily to 15. Tactical Update: Not much has changed here – it’s just that the execution has gotten much shoddier. Stan is still trying to engage in as many CC FHs as he can, while Djokovic seems unsure as to whether he should try to outmaneuver Stan with his usual FH + BH combo, or just with the FH. 3-0, Djokovic: Stan gets a little nervy, but ends up holding after one deuce anyway. Crowd seems dead, and I can’t blame them. This match has lacked any sort of rhythm or sustained good form from either man. Right now, it’s just a hot mess. 3-1, Djokovic: A brilliant CC angled BH by Djokovic sets up 40-0. That’s a great idea to use against Stan…but far from a high % shot. A gorgeous BH DTL (remember those?) seals the love hold. Medical Update: Stan has called the trainer, and both men have disappeared into the locker-room. 4-1, Djokovic: Stan comes back and quickly fires a FH into the net for 15-30. However, a well-executed net approach levels the game. Moments later, he seals the hold for 30. Djokovic really in a MessDay. Even the : "make him run" seems a highly hard thing to do. 4-2, Djokovic: Things get a little nervy at 30-all, but the suspense is quite fleeting. Hold to 30 ensues. 5-2, Djokovic: Stan unleashes some big forehands at 30-15, and ends up holding moments later. 5-3, Djokovic: At 15-all, Stan seems to over stretch his (apparently injured) groin. 30-15. BH UFE by Djokovic makes it 30-all. Stan goes for a big BH DTL winner…and misses it wide. SP for Djokovic. It is converted via an Ace up the T.
Fourth Set to Novak Djokovic, 6-3. Fifth Set – Stan Wawrinka will serve first. 0-0: Stan donates an UFE and goes down 0-30. He then goes on the attack with his FH (as he always, always should), and forces the error. Big SW out wide, and it’s 30-all. Rinse and repeat, and Stan has a GP. Djokovic then runs Wawrinka ragged (Stan’s movement to his FH seems quite iffy), but ends up dumping a BH CC well wide. 1-0, Wawrinka: Stan goes for a huge FH DTL at 30-all, but misses. An Ace out wide seals the hold for Djokovic, who sent a very simple smash straight at Wawrinka a t 30-15, which resulted in him eventually losing the point. 1-1: Djokovic plays incredible defense at 30-0, and then correctly executes a CC BH pass after an ill-advised Wawrinka net approach. Stan gets to GP…but DFed. Stan comes to net again…and nets the volley. He was so very slow coming to net after a decent FH DTL approach. BP for Djokovic, and it’s saved by a great CC FH that opened up a simple putaway. Stan then hits what looked like a clean BH DTL winner…but it’s called out. Big body serve saves the ensuing BP, though. Stan now DFs again. 3rd BP for Djokovic in this set. A very tentative rally ends when Stan slowly pushes Djokovic back and forces the error. Novak had plenty of chances to take the initiative in that rally, and ceded them all happily to Stan. It’ll be a 4th BP for Djokovic after a timely BH DTL. Again, Stan takes the initiative in a very neutral rally, and finishes with a flourish of a BH DTL winner. Body serve + loud “Come on!”, and Stan has a GP. Djokovic then forces the error with a good FH DTL runner that forces Stan’s error. But a good serve up the T offers Stan the chance to put away a very short and easy FH. GP again. Somehow, Djokovic gets the better of a CC BH rally. Stan goes on the attack after some floater returns by Djokovic, so GP for him again…which ends up being wasted by a FH UFE. A more interesting rally ends with another BH UFE by Stan when going DTL. BP #5 for Djokovic. It goes begging as Djokovic can’t put in play a 2nd serve return with his BH. This is dire. Deuce #9. Djokovic gets Roddicked after a silly net approach, and it’s GP for Stan yet again. But Deuce #10 after a Stan FH UFE. But GP again after a SW up the T. However, Deuce #11 comes after a good I-I FH by Djokovic forces Stan’s error. A below average return gives Stan a chance to attack, and he does. GP for him. Then, Deuce #12 after Djokovic hits a good dropper + lob combo. Stan runs all over the court…for naught. However, a great CC FH by Stan forces the error, so he’ll have another GP. Crowd is going nuts now. SW up the T, and this game has finally ended. Wawrinka's first-serve percentage is a .gif of a calf falling down a waterslide. I'll never forget the two days I spent at the third game of the fifth set of the Djokovic-Wawrinka semifinal. So…that was an eventful game. 2-1, Wawrinka: Djokovic goes up 30-0 very quickly, and then DFs. A FH putaway makes it 40-15. Moments later, Djokovic has held. 2-2: Stan badly misses a BH DTL, and it’s 15-30. Then Stan badly misses a CC FH, so it’s 15-40. Red Alert for Wawrinka. 2nd serve… and Djokovic can’t put it back in play. Atrocious, costly miss from the man many consider the best returner on the planet. Then Djokovic sends a loopy I-O FH wide. I have no words. But then, an insane return of a 1st serve. BP again. Stan badly misses a regulation CC BH, and Djokovic has finally broken serve. 4/19 on break points but finally Djokovic gets the break for 3-2. 3h48' of play. Fragile Djoker but he's at 3 games to keep his Throne. 3-2, Djokovic: Novak races to a 40-15 lead…but then sends a dropper into the net. SW up the T, and the hold is achieved. 4-2, Djokovic: There was a slight opening for Djokovic to make this another tough, complicated game, but he overcooks a return badly at 40-30, and Stan has held. 4-3, Djokovic: Djokovic goes up 40-15 after hitting a line, and then he barely catches the middle service line for an Ace. 5-3, Djokovic: It’s 40-0 after a badly missed return by Djokovic. A good Stan CC FH winner seals the hold. Djokovic will try to serve out this semifinal. 5-4, Djokovic: Stan sends a BH CC long, unprompted. 15-0. For once, a well constructed and executed net approach: I-I FH, simple CC BH volley. 30-0. Good serve up the T sets up a short FH which is correctly executed. 40-0, triple MP. First is wasted by a FH UFE into the net. And the match is over when Djokovic sends an Ace up the T.
Game, Set and Match to Novak Djokovic, 2-6, 7-6 (4), 3-6, 6-3, 6-4. I’ve already spent way more energy writing about this tennis match than it deserved. It was a mediocre affair almost from start to finish and I’ll do my best to erase it from memory. LOL! That Feliciano comment made me spit out me coffee! Can’t recall the last time I saw Novak playing quite this badly. Wow. He completely lacks confidence. Misses all the “big points” – break chances on his serve, break chances on Stan’s serve. It the last year, he was nervous in every big match he played: Murray in Australia, Nadal at the FO ant in Canada, Murray in Wimby… He has a big problem with confidence in this moment. His biggest problem is that he hasn’t quite find his game. I thought that if he wins a difficult match, he will have to rise his level significantly. But he managed to win without playing his best. Let’s also add that Wawrinka played better in the QF. bad movement: very often, he was late on the ball, I couldn’t make his mind if he was going to a IO FH or a BH. Oh well! Congrats to Nole for fighting through when clearly not at his best. This is the 3rd year in a row that he’s reached 3 of 4 slam finals (winning 5 of those 9 so far). This is the 7th hard court slam final Nole has reached in a row. 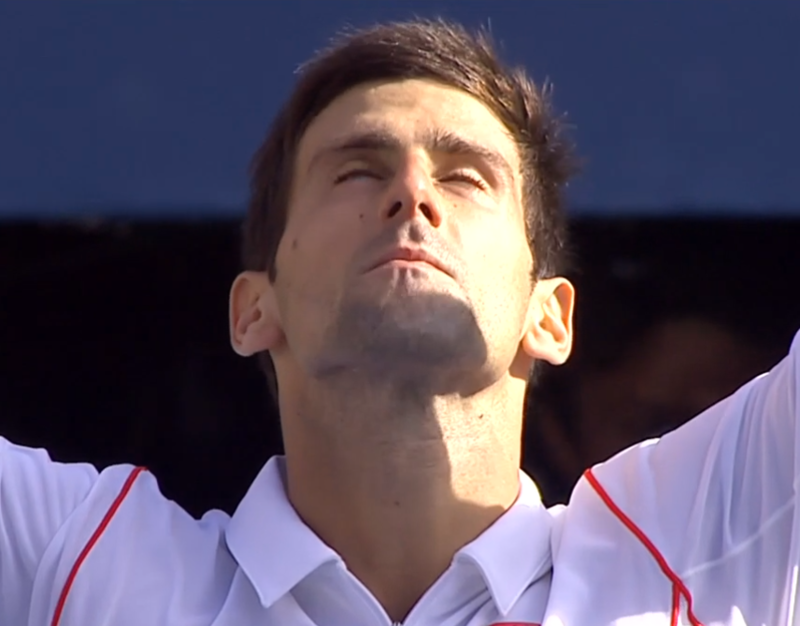 So no matter what I am proud of Nole. He never shies from a challenge, and he puts himself in contention again and again. what gives me some hope for the final is that Rafa doesn’t play well either. He made 22 UE in the first two sets, his second serve wasn’t good, and it seemed that perhaps he has difficulties moving from right to left. I believe that his present game is overrated, and that he would have as many problems as Murray or Djokovic against a heavy hitter like Wawrinka, especially the way Wawa hit his CC FH, and flatten his shots. The way Wawrinka returned in his previous matches, Rafa’s second serve would have been under big pressure too. that was heartbreaking for Stan, im just heartbroken. Nole sure loves his epic 5-setter semifinal matches. 🙂 vs Rafa at Roland Garros, DelPo at Wimbledon and now Stan! What a fighter. But oh boy, Nole vs. Rafa matches gives me mini-breakdowns and heart palpitation since 2010.
mat4, I hope so. Oh, how I hope so! Great job! Hope you enjoy my blog also! In the meantime, I watched two sets of Rafa-Richard and, of course, the last two sets of Novak-Stan. The fist impression was different, but now, it seems to me that Novak didn’t play that bad that last sequence. It was very difficult to find any rhythm against Stan, who mixed slices and flat shots, touch and power, and was able to accelerate any time. Then, he forced Novak to generate his own pace, and his defence was sublime. Novak slowly improved his game and his stats. Less UE, more depth in his shots, better transition game… a more efficient serve, also. I don’t think that Rafa played better in the first two sets of his match against Gasquet. BTW: J.J., the author, is probably also a fan of Novak.